Setsuko kida was born July 7 in Osaka, Japan. Setsuko started learning the piano at the age of 7. After graduating Osaka Shinai girl’s seminary junior college of primary education faculty, Setsuko started working as a music instructor of Piano and Electric organ at KAWAI Instrumental Company. At the same time, Setsuko made her debut as a Player belonging to Kansai Music Office. Then, Setsuko also made her debut as a MC because Setsuko was recognized as a multi-talented person. One day in 1992, Setsuko suddenly lost her falsetto due to a thyroidectomy. Setsuko lost her joy of singing. However, Setsuko experienced the possibility of singing again by being exposed to Jazz vocals when I met my Japanese vocal teacher Atsuko Nishida in August, 2007. Then Setsuko went to study Jazz vocal in New York for a year where she had private voice training lessons with Al Foster as well as lessons with Sofia Rei at New York Jazz Academy. Setsuko had many good experiences singing at the restaurants, cafes and the singer show case performance stages. At last, Setsuko had her first solo performance in Manhattan “ Farewell New York” in 2010. Setsuko has started working as a vocalist in Japan since 2011. Setsuko has been teaching the piano and the electric organ at her home for many years. 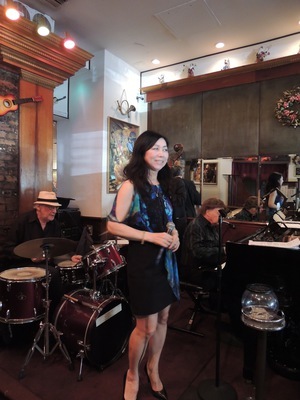 In recent past few years, Setsuko was back and forth between Japan and New York studying jazz vocals. 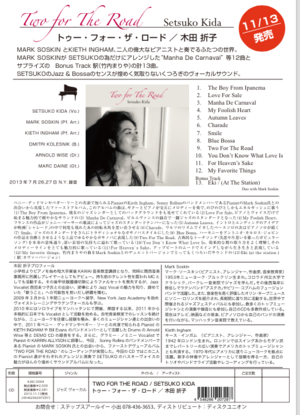 In May, 2011, Setsuko made a CD for DEMO with Keith Ingham ( the well-known pianist for Peggy Lee and Benny Goodman) Drums Arnold Wise who was a member of Bill Evans trio and Bassist Alex Gressel. Then Setsuko met Karrin Allyson, Grammy Nominated singer and pianist, as well as Roseanna Vitro , Judy Niemack, the great,outstanding Jazz singer and studied vocals with them. Setsuko got together Worldwide Pianist Mark Soskin through Atsuko Nishida, he has been playing with Sonny Rollins and working as a music educator. Setsuko had an opportunity to record her CD with Mark Soskin and Keith Ingham, Arnold Wise, Dmitri Kolesnik( Bass) and Marc Daine (Guitor) at Acoustic Recording Studios in Brooklyn on July 26 and 27th in 2013. Her first debut album “TWO FOR THE ROAD” was released from the Spontaneous label on Nov,13th in Japan and in the world. Setsuko has been continuing her vocal jazz studies with great teachers such as : Karrin Allyson, Jay Clayton, Roseanna Vitro, and Judy Niemack, and pianists in New York.